It's rare to look at a scoreboard following a baseball game and see the same number in a team's runs and hits columns. It's even rarer for that team to win the contest, but that's what happened Sunday afternoon at Citizens Bank Park. 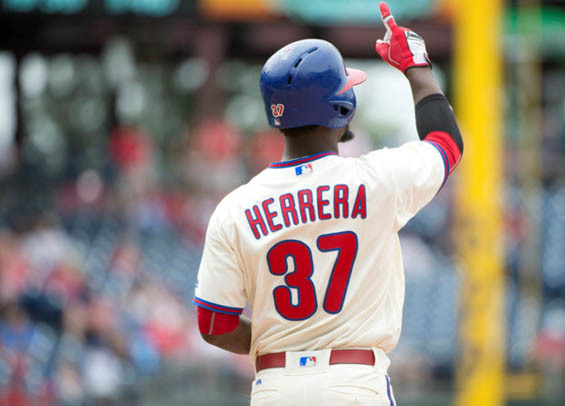 Behind only four hits, the Phillies took advantage of four walks and played small-ball when necessary to beat the Brewers, 4-3, to snap a four-game skid. "You only get a few hits during the game, but you score runs because you move runners, drive runners in from third base with less than two outs. I thought it was well played all-around," said Phillies manager Gabe Kapler. Trailing 2-1 entering the bottom of the fifth, J.P. Crawford opened the frame with a single to right-center before advancing to second on a hard-hit Andrew Knapp grounder to third that was misplayed by Travis Shaw. Zach Eflin followed laying a sacrifice bunt down the first base line that turned into a fielder's choice as Crawford was safe on a play at third. Cesar Hernandez worked a walk to force in a run, and Rhys Hoskins lofted a sacrifice fly to center scoring Knapp to give the Phillies a 3-2 advantage. Odubel Herrera then drove in Eflin on a groundout to give the Phillies a two-run cushion. "[Eflin] gave up the couple runs in the fifth inning and we thought we may have to hit for him," Kapler said. "It was cool we got into that first and second situation and the opportunity to have him bunt. He laid down a beautiful sacrifice bunt and J.P. gets an exceptional jump ... I think that was probably the biggest moment in the game." Eflin tossed a shutdown sixth for the Phillies, sitting the Brewers down in order to seal his afternoon. Over six innings he matched a career-high with nine strikeouts. He threw 60 of 94 pitches for strikes and allowed just one baserunner through the first four innings. "On a day like today where it was rainy I really wanted to go in and throw my four-seam with conviction on the inside and keep them off balance with my off-speed," Eflin said. Seranthony Dominguez tossed two innings in relief, surrendering one run on three hits. He struck out four and threw 41 pitches. Tommy Hunter collected the save recording the final out in the ninth, bailing out Luis Garcia who surrendered a single and a double back-to-back with two outs in the frame. "Seranthony was awesome," Kapler said. "One of the things that light's our dugout up is watching the opposing batters when they see the first pitch come out of Seranthony's hand. We see a lot of 'Wow' or 'Where did that come from' kind of stuff, so those reactions the opposing hitters are giving us when they see him for the first time is really telling. His stuff is nasty." Hoskins drove in a pair of runs in the winning effort, marking the first time since last September that he's pieced together back-to-back multi-RBI games. The victory was the 20th of the season for the Phillies at Citizens Bank Park, marking the earliest point in the year the club has hit the 20-win total since 2011. "I thought that was a really fun and well-played baseball game," Kapler said. The Phillies have an off day on Monday before opening a three-game set with the Rockies on Tuesday.